Our beautiful fall weather continued on Sunday, November 7 with high temperatures once again in the 70’s. 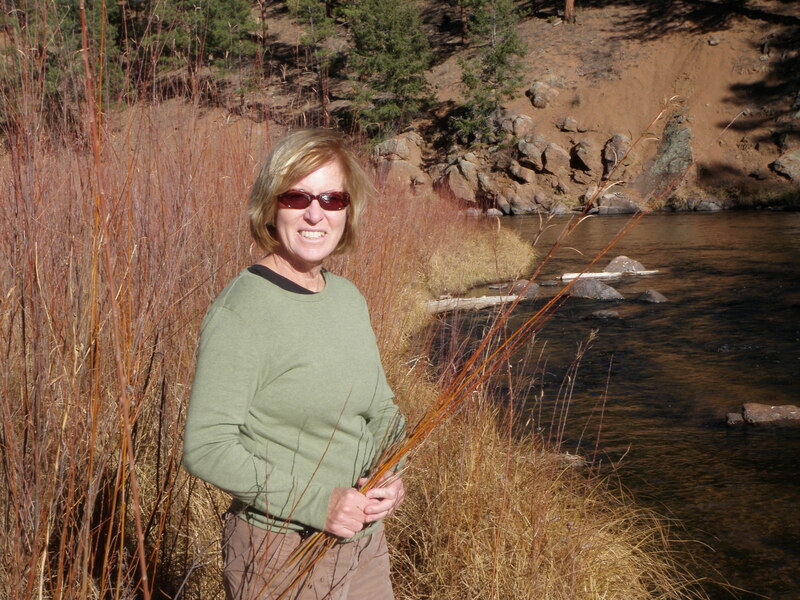 Jane expressed a desire to get out of Denver, so we prepared to drive to the South Platte River below Deckers. I threw my fishing stuff in the van, but had low expectations as our primary purpose was to enjoy a wonderful fall day. Dan called as I was loading the car and asked to jump on board, so we picked up sandwiches at Jimmy Johns for three, then picked up Dan and headed to the river. We arrived at the pullout at around noon and hiked the path to a spot next to the river where we ate our lunches. I’d chosen a spot that we frequented quite a bit when we lived in Castle Pines, but I hadn’t been there in the last 10 years or so. The river makes a huge oxbow bend away from the road, so we hiked on a nice path along the ridge around which the river bends. There is a campground and parking lot where the river meets the road again after making the large bend. I began fishing on the north side of the bend, but not too far from the farthest point away from the road. I tied on an olive woolly bugger with a black marabou tail and began working it in a nice deep riffle. I didn’t have any success, nor did I see any fish, so I moved upstream to an area where a large boulder protruded from the river. I spotted a fish hugging the bottom next to the boulder and worked the bugger past the fish numerous times to no avail. Since I could see the fish, there appeared to be no reaction to the woolly bugger. Meanwhile I thought I spotted a rise in the run above the rock where the river ran near the far bank. 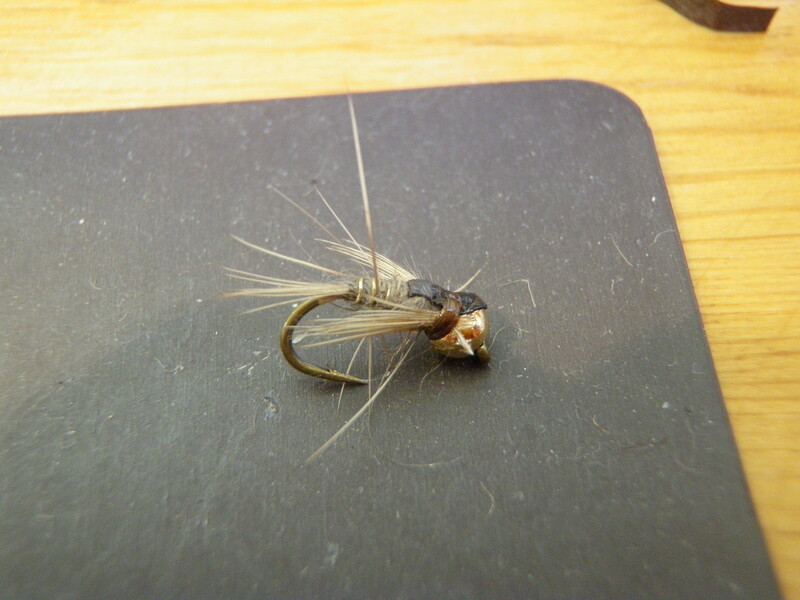 I quickly clipped off the streamer and tied on a dark olive body deer hair caddis. A second trout rose just below a small rock next to the bank. 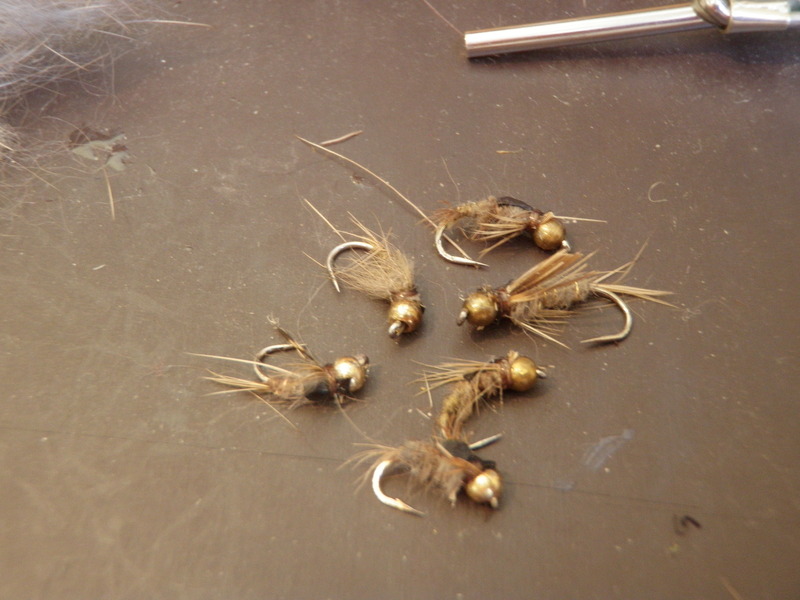 I began casting the caddis and on one of the drifts the fish rose and sipped the caddis. I set the hook and felt some weight for a split second before the fish flipped off the hook. I continued throwing casts higher in the run next to the small rock, but I couldn’t entice a rise and assumed that the hook up had spooked the fish in the area. Around this time I spotted a couple of tiny mayflies on the surface and guessed these caused the few rises. 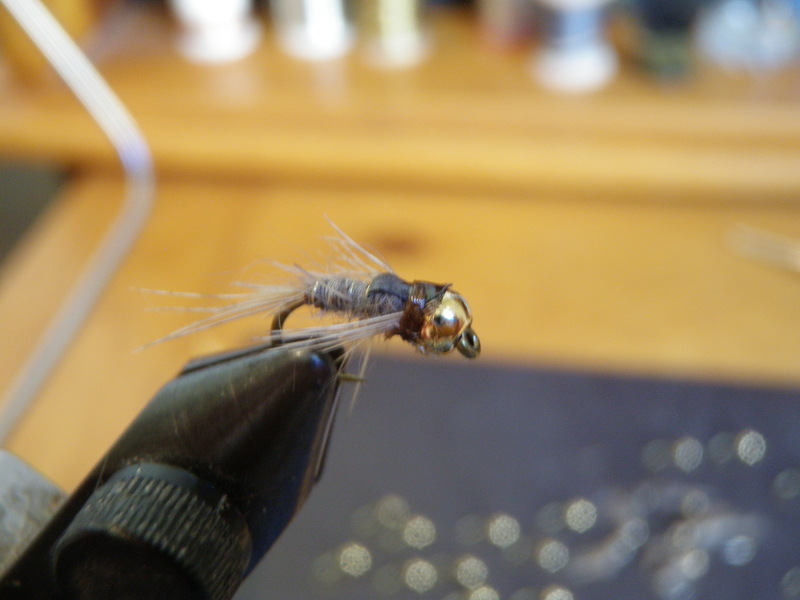 I switched the caddis for a CDC BWO and drifted it through the area, but this also didn’t pay any dividends. Would they grab a tiny baetis nymph? Next I tied on a Chernobyl ant and trailed a small gold bead baetis nymph. I worked the area thoroughly, but eventually gave up and moved upstream. I used the Chernobyl and nymph to search some nice deep holes around large in-stream boulders and experienced one refusal to the Chernobyl just as it started to drag around a rock. I continued moving upstream to a very nice eddy at the south side of the oxbow bend. When the sun went behind a cloud I spotted several rises right where the eddy reached its furthest point and began flowing back upstream. 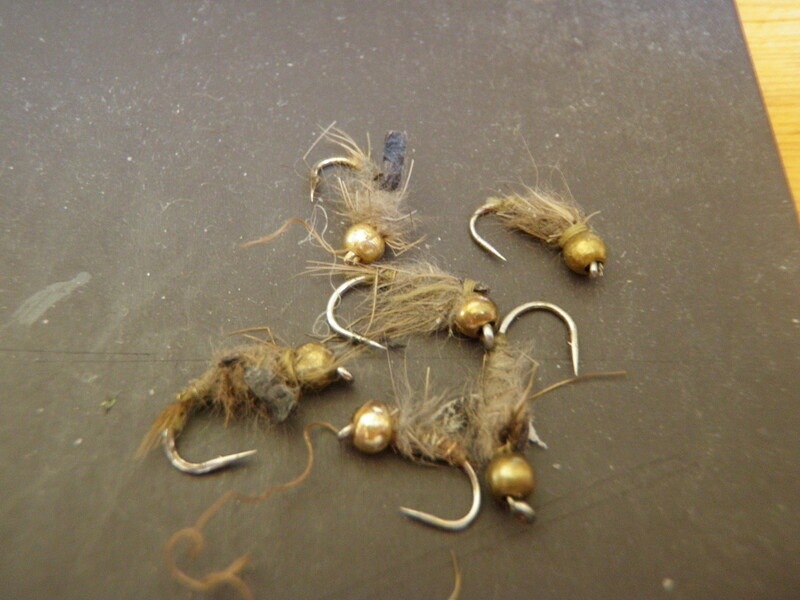 I quickly clipped off the Chernobyl and nymph and tied the CDC BWO back on. I was certain that I’d catch this fish, but it didn’t happen. I continued fishing up through this area with several juicy eddies and sloughs next to the main current. Dan had hiked up from where he and Jane were sitting and chatting, and he watched my failed attempt at the riser. Next I moved up beyond the bend to a nice spot were a fallen tree provided a narrow window of cover. I probed this and once again saw no sign of a fish. It was now getting late in the afternoon and with the time change shadows were covering the southern half of the river. 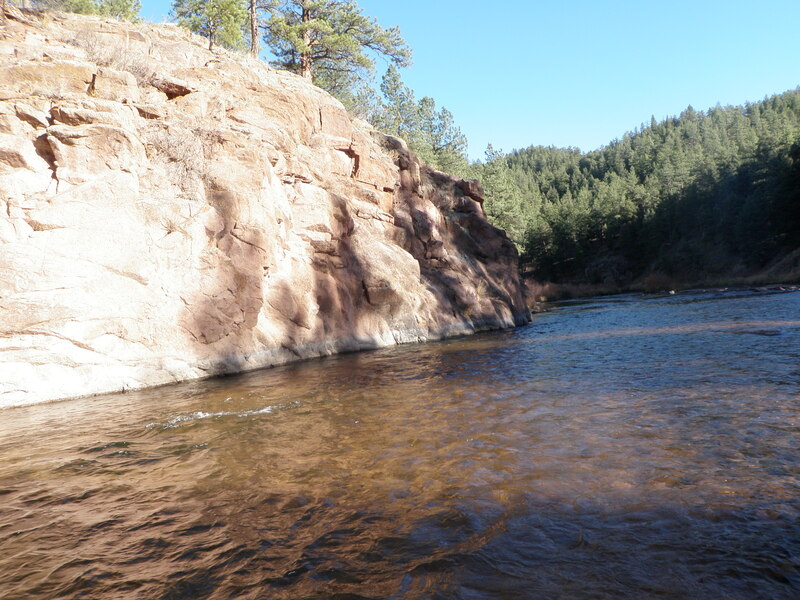 I quickly exited the river and hiked the north bank to a place where I could cross at a shallow riffle and then waded up the river to a high rock wall. Many years ago I’d fished to numerous rising fish here during a BWO hatch. Alas there were no rising fish on this visit. I made some nice drifts from above through the nice narrow pool just upstream of where the current ran against the rock wall with the CDC BWO and then switched back to the caddis to provide something a little larger in the absence of a specific hatch. None of these strategies worked so I decided to clip the caddis to my hook guide and head back to Jane and Dan and possibly give the bend spot another chance. Sure enough when I cast the caddis to the spot where I’d seen the fish rise several times in the eddy, a trout tipped up and sucked in my fly. Once again I raised my rod to set the hook and felt weight for a split second before the fish fell off. I let out a shriek of agony as I knew I’d just blown my best chance at avoiding a skunking. Jane and Dan asked what happened when I walked near their blanket, and I explained the near miss. I walked back to my initial scene of rising trout and tried some drifts there to no avail and then went further downstream and prospected some areas that looked encouraging with no success. It was around 3:30 and the sun was setting behind the canyon walls, so I returned to Jane and Dan, and we hiked back to the car. It was a pleasant day for early November, and I had a bit of action even though I failed to land a fish. I spent yesterday editing my fishing log entries, adding photos and posting the resultant product to this web site. I added all the fishing outings prior to when I began using the WordPress site as pages as I did not want older fishing blogs to appear in front of the more current entries from late in the season. Consequently you will see quite a volume of links to pages in the black section at the top of my web page. 1. Arkansas River – 5/4/10 – You’ll find this one in the black page section. The pages are listed alphabetically. After years of pursuing the fabled Arkansas caddis emergence, I succeeded. This day above all others stands out as my favorite of the year. 2. 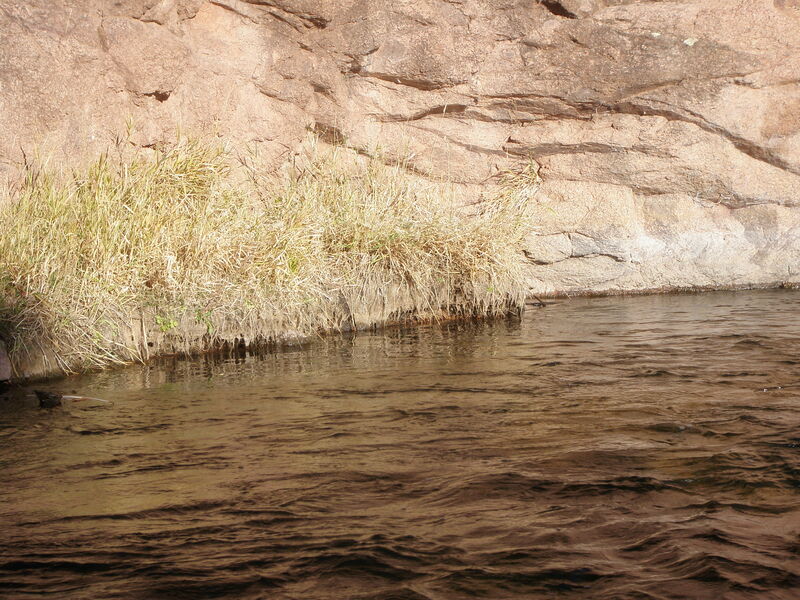 Frying Pan River – 9/5/10 – My favorite Colorado River and success with green drakes make this number two. My comparaduns failed me on Thursday, but after purchasing green drake imitations, I discovered that my comparaduns outperformed the store bought. Vindication is sweet. 3. 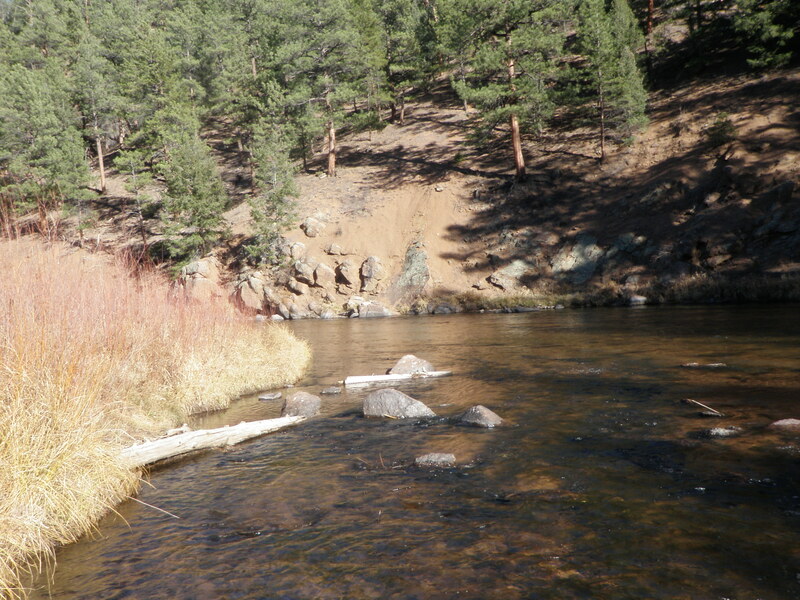 North Fork of St. Vrain River – 8/2/10 – Based on number of fish and rediscovering a stream I’d forgotten about, the NF of St. Vrain ranks third. Add in the fact that I caught a couple lake trout and some fish that were quite large for the size of the stream fished and this was a fun day. 4. White River – 9/14/10 – Hot rainbows in a remote environment with no other fishermen around adds up to a great day on the White River. A moose sighting was icing on the cake. 5. 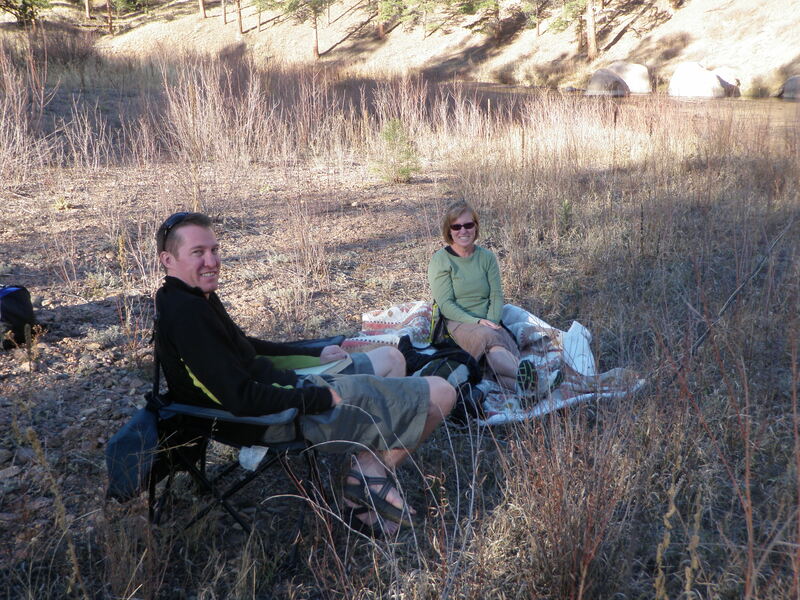 North Fork of St. Vrain River – 9/19/10 – A remote outing with my son to a beautiful place with lots of fish puts this day in the top five. Dan landed 14 fish, and I was very proud. Of course Dan offering to carry my heavier backpack on the steep hike out of the canyon was also a nice gesture. 6. 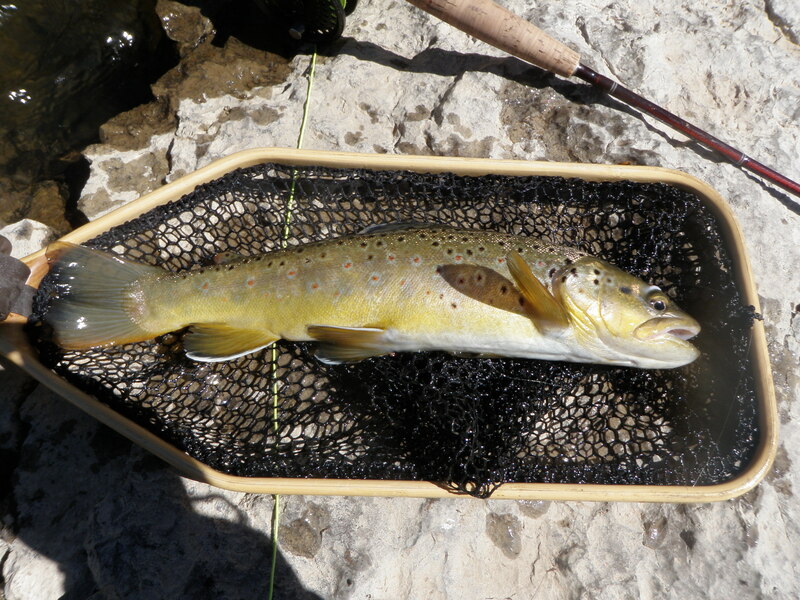 Arkansas River 5/14/10 – A second caddis hatch, albeit not as intense as the first, in the same season places this in the top ten. Catching fish when others aren’t shouldn’t affect my thinking, but it tends to. This one’s a page in the black section. 7. Brush Creek – 7/10/10 – The outing at dusk was probably the best hour of fishing I had in 2010. Thank you Dave Gaboury for allowing me to experience this. This post is in the pages section. 8. Frying Pan River – 10/1/10 – My most successful BWO experience of the season, but the general elevates this to top 10. 9. North Platte River – 9/16/10 – Discovering new water that I’d never fished is a factor in ranking this in the top 10. The setting was beautiful. I could have caught more fish, but this was an R&D day. 10. Fooses Creek – 7/17/10 – Another fun rediscovered stream and proving that I can still contort my body and make challenging casts in tight quarters place this in the top ten. This is another page link in the black section. For 2011 I will be using WordPress from the first day of the season until the end, so I will continue to add new entries as posts. Once I’ve used all the alloted free space, I’ll likely begin deleting pages as I add new chronological posts. The alternative will be to purchase additional space. I have quite a bit of free space remaining, so I’ll have some time to address this.